His beautiful analogy has helped a great many Christians to understand the relationship God wants them to know. In that unique way which was his, our Lord took what lay at hand and made it unfold spiritual truth. When he said, “I am the true vine,” he did not mean, “true in contrast with something false, fake, counterfeit,” but rather “real, genuine, as opposed to the mere copy or symbol.” As he held this vine and its branches in his hand, he indicated that this was the copy. He was the true vine. He was the vine from which true life is received. The purpose of this vine, obviously, is to bring forth fruit. A vineyard is planted not for ornamentation, but to produce grapes, to bear fruit. This is the point our Lord makes in the story. All through this account his emphasis is upon the fruit. So the question arises at this point, “What does this fruit stand for in our life?” He is the vine, we are the branches. The fruit is borne by the branches produced by the vine. What is that fruit? Fruit, here, is that which is produced by the vine and is the natural outflow of the life of the vine. If we use the basic principle of understanding Scripture, which is common to all of Scripture — letting Scripture interpret itself — there is no doubt as to what this fruit is. The figure of the vine is used many times in the Scriptures. These disciples, familiar with the Old Testament, would immediately think of several places where it was used. One is in Isaiah 5: “For the vineyard of the Lord of hosts is the house [the nation] of Israel,” (Isa 5:7a). And in the 80th Psalm, the Psalmist says that God “brought a vine out of Egypt” and planted it in a good land, (cf, Psa 80:8). Israel was that vine. As Isaiah tells us, God cleared out the rocks in his vineyard and hedged it about. He built a tower; he protected the vineyard and cared for it, (cf, Isa 5:2). He did everything possible to cause it to produce grapes. But when he came into his vineyard and looked for grapes, he found wild grapes instead sour, tasteless grapes. God came looking for justice and righteousness; instead he found oppression, cruelty, exploitation, and indifference to the needs of others. So it is evident from that parable that the fruit which God expects of the vine is moral character, or as we have it in the New Testament, the fruit of the Spirit — the fruit which the Spirit produces. 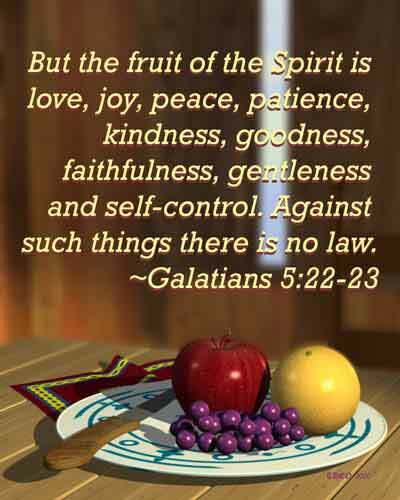 The life which is in the vine produces fruit which Paul describes in Galatians 5 as: love, joy, peace, longsuffering, gentleness, goodness, faith, meekness, self-control. The fruit, in other words, is Christ-likeness. And our Lord is indicating that the very purpose of the vine is to produce such fruit. That is, he cuts it off, he eliminates it from the life of the vine. We will see more of what that means as we go on in this account. He is teaching us here that right in the midst of the circumstances of life there can be more likeness to Christ, more of the moral character of Jesus, more fruit. I struggled for a while with this word prunes because in the Greek it is really “cleanses.” It seemed to me a far cry from cleansing away debris to pruning back the branches — until I learned that, in the usual practice of viticulture (i.e., the care of vines), the branches are pruned back each year in order to cleanse them. That is, a vine produces certain shoots (called “sucker” shoots) which start to grow where the branch joins the stem. If allowed to continue to grow, they would dissipate the life of the vine through so many branches that the vine would produce little or no fruit but would produce leaves instead. So every vinedresser knows it is important to prune away these little sucker shoots in order that the vine may produce more fruit. And since they grow right where the branch joins the stem, creating a tight cluster where dirt, leaves, and other debris collect, the pruning is therefore a cleansing process. This is what our Lord has in view. The Father’s work is to find a branch which is beginning to bear fruit, beginning to produce the likeness of Christ, and to cut it back, trim off the shoots, so that it may bear more fruit. You can see what a beautiful analogy this is to the Christian experience, for in our lives we have that within us which produces the fruit of the Spirit. We do not have to work at it. We do not have to agonize and struggle to produce these qualities or characteristics; they are brought about naturally by the vine. Did you ever see a bunch of grapes struggling to hang onto the vine, trying to grow larger? How difficult that would be! No, it simply stays in the vine and lets the life of the vine produce the fruit. Here in remarkable imagery he captures the work which goes on in our lives as the Father employs the circumstances in which we are found, the situations of our lives, to make us heed and hear the Word which corrects and changes. I am sure you have all had the experience of being confronted with a word of Scripture and learning from it that something you had been doing all your life, and which you thought was right, was actually wrong. Perhaps you were manifesting or defending some attitude. Your whole family had done it; it had been a family characteristic. Therefore, you thought it was right. But you learned from the Word that it was wrong. Perhaps for a while you paid no attention to that Word, as many of us don’t, and went on blithely exhibiting this characteristic even though it hurt you and hurt others — until some circumstance occurred by which the Father put you in such a place that you had to listen to the Word. The hurt was too severe. You suddenly were confronted with what you were doing to yourself and to others — you felt it and heard it and saw it. That is the Father’s pruning knife cutting off the sucker shoots of the old life within us, so that we might produce more of the Christlikeness, the fruit of the Spirit. This is the work of the Father. He not only does this, but he does it repeatedly. Notice that Jesus says here to the disciples, “You are already made clean.” That is, “This pruning has gone on in your life already.” But that was not the end of it; there was to be more as they went on. In a vineyard the vines are pruned not just once in their lifetimes; the process is repeated every spring. There is a pruning time, a pruning season. Are you going through a pruning season right now? Is God using the sharp knife of circumstances to cut off the “sucker shoot” of an old habit or attitude in your life, confronting you with that word of truth which corrects and cleanses, causing you to see it and feel it and hear it and give heed to it? Well, that is the work of the Father, and it is done in order that you might bear more fruit, be more like Jesus in your reactions — in your home, in your shop, in your recreation, wherever you may be with people — that you may be like Christ. This is an extremely helpful passage! Notice that our Lord divides it into two sections. There is an activity which is to be done, and a passivity which is to be acknowledged — an active voice and a passive voice. We are to abide in him (that is active, something we do), and we are to let him abide in us (that is passive, something we allow him to do). Both these relationships are absolutely essential, not one as opposed to the other but both together. When our Lord says “Abide in me,” he is talking about the will, about the choices, the decisions we make. We must decide to do things which expose ourselves to him and keep ourselves in contact with him. This is what it means to abide in him. We have been placed into Christ by the Holy Spirit. Now we must choose to maintain that relationship by the decisions we make, i.e., decisions to expose ourselves to his Word in order to learn about him, and to relate to him in prayer wherein we converse with him, and to relate to other believers in body-life experiences, i.e., bearing one another’s burdens and confessing our faults and sharing in fellowship with one another, wherein we learn about and see Christ in one another. All of this is designed to relate to him — “Abide in me.” If we do that we are fulfilling this active, necessary decision of the will to obey his Word, to do what he says, and to stay in touch with him. This is what Bible study and prayer are all about. They are not mere mechanical practices which every Christian ought to do in order to stay “in” with the crowd, or to maintain his “membership card,” or to get “brownie points” with God! No, they are means by which we know him. If you open your Bible and begin to read it without the conscious expectation that it is going to tell you something about him, you will read in vain. If you try to pray as though it were some exercise in which you chalk off fifteen minutes’ worth, mechanically going through a list like the turning of a prayer wheel, it is a valueless experience. But if you pray because you are talking with One whom you love and want to know more of, sharing with him out of the fullness of your heart, then prayer becomes a beautiful and marvelous experience. One of the delights of life is to spend time in that kind of prayer. If in relating to others you merely get together and have coffee and talk about the weather, you will find it useless. But if you share where you are spiritually, what your struggles are, what you are going through, and if you bear one another’s burdens and love each other in the Lord, it becomes a delightful, marvelous, strengthening experience. Christ then becomes real to you. That is abiding in him. But that is only part of it. Jesus says, “Abide in me, and I in you.” There is also the other side — “Let me abide in you.” What is that? Well, that has to do with empowerment, enablement. You see, you can make choices but you cannot fulfill them. And though you are responsible to make the decisions and make the choices, you are not responsible for the power to carry them out. There you are to depend on him, to let him abide in you. You are to rest upon his ability to see you through, to work it out. As you venture out on that basis you expect him to support you and to carry you through. Both of these are necessary in the Christian experience. We must make choices, we must determine to expose ourselves to him, we must seek his face in the Word and in prayer and in fellowship with others. And then we must rest on him, count on him to see us through, to supply that enabling power which makes us able to love and forgive and rejoice and give thanks, even when everything is going wrong. When we do, we are abiding in him and letting him abide in us. Without both of those, fruitlessness is the result. You see, you can do many things without depending on Christ. He does not mean that without him you remain just an immobile blob. You can operate your business without Christ. You can make it run well. You can raise your family without Christ. You can even pastor a church without Christ. But if you try, you find that there will be no fruit, no Christlikeness, no manifestation of that beautiful character which arrests the attention of others. Instead there will be a shabby sham, a phony imitation of the real thing, which will drive people away from Christ and will produce nothing but a dull, mechanical religiosity which is piousness without God. Here is the case our Lord mentioned earlier when he said, of one aspect of the Father’s work, “every branch of mine that bears no fruit, he takes away.” Here is the process in which the branch is cut off, and then it withers — grows dry and dull and dead. And many a churchgoer is in that state. They may have been members of churches for years, but there is no life evident at all. Eventually these branches are to be gathered and burned. I believe this is a reference to other such Scripture passages which say that the angels will be sent out to gather out all which offends in God’s kingdom and cast it into the eternal fire where it will be burned. Judas was a paramount example of this. He was with the Lord — spent three and a half years with him. He even shared in the experience of ministry with the other disciples. He exercised the power of God by performing miracles. But there was no life in him. He did not abide in Christ, and Christ did not abide in him. As a result he was cut off, and he withered. The withering process was very short in his case. He committed suicide within a few days, and he was burned — eternally lost. This is a picture of those church members who, despite attending church, never have any manifestation of truth, never have any sign in their lives of that quality of love and forgiveness and understanding and compassion which is born of the Holy Spirit, but are rigid and narrow and hard and harsh and condemning and difficult — even though they say and do the “right” thing. On the other hand, our Lord gives us the results of fruitbearing — four beautiful manifestations. That frightens some people. All they hear is, “Do as you please.” But it must be preceded by that vital phrase, “Love God.” When you love God, then all that you do is touched and controlled by love, and love is the fulfilling of the Law. So you can do what you please when you love God. And if you are truly loving him, you can ask whatever you will. This is the glory of Christian liberty. Prayers are answered, growing out of that relationship of an obedient and a dependent heart — leaving the process and timing to God. You cannot tell him when to answer your prayers. You cannot tell him how to answer your prayers. But he will answer your prayers when they grow out of this relationship. God is glorified when his people manifest fruit, i.e., Christlikeness. You do not even have to do a thing to manifest that. You can be flat on your back in bed, sick, but manifesting a Christ-like spirit, and you are glorifying God by that experience. It is not activity which glorifies God; it is character, it is what you are, and the way you react to a situation. Do you want to be known as a disciple of Jesus? Do you want to be recognized as one who follows Jesus? Well then, manifest fruit in your life by abiding in him, and he in you. This is the way that manifestation of discipleship is accomplished. A friend of mine passed through Palo Alto this week on his way to Colorado to participate in a very unusual ranch. This ranch is owned and operated by a mutual friend and is designed as a guest-ranch for wealthy and affluent people. The man who owns it has a heart of concern for what he calls “the up-and-outers” — those who are over-privileged, who have all too much of everything, yet to whom very few are witnessing, telling them of life in Christ. So he has designed this ranch for that purpose. People come and spend a lot of money, staying a week or so at a time. There are no Bible studies, no meetings; it is a very low-key approach. First, “Do you love work?” because they are going to have to work sometimes from seven in the morning until ten or eleven at night. He wants them to love their work. Then, “Do you love people, do you like to be with people and relate to them?” They must satisfy him that they love people. The third question is, “Do you love Jesus?” If they can assure him that they love work, love people, and love Jesus, then they have a tremendous opportunity to work at that ranch. From then on there are still no meetings, but invariably every week there are those guests who come and say, “I want to know more about this.” And there are conversions after conversions throughout the remainder of the week — because of young people who manifest by their lives that they are Jesus’ disciples. They prove to be his disciples. Remember that earlier in the passage our Lord had said, “If you love me, you will keep my commandments,” (John 14:15 RSV). And from that we saw that obedience grows out of love. It is the love of Jesus for us, “shed abroad in our hearts by the Holy Spirit” (Rom 5:5 KJV), which awakens our love toward him in response. When our hearts are moved by love it is easy to obey his word, for we obey the one we love. He adds here the ingredient that when we obey his word, keep his commandments, we will abide in his love. It becomes a continuing sense and experience of his love for us. So it is a complete cycle which keeps producing deeper and deeper experiences of love. All of us have learned, one way or another, that love demands a response if it is to grow. If you love somebody, and reach out toward them, you can go only so far unless they respond to that love. If they respond just a little, then your love can reach out further, can deepen and grow. But if they remain unresponsive over the weeks and months and years, love finally is limited to that initial step of reaching out to them. But where love is responded to, it grows deeper and richer and truer, and eventually becomes a glorious experience. If you are not feeling the depth of love you would like to experience, one of the reasons may be that you are not responding to the love which is already reaching out to you. That is why the New Testament says: Open your hearts, widen your hearts, be responsive — love back. When you do that, then love grows into this deepening, quickening experience. His joy, the joy that was always there at the bottom of his heart, that gladness of relationship with his Father, is now to be our experience. Joy, that sense of gladness of relationship with him, will increase as we go. I love the saying, “Joy is the flag which flies over the castle of the heart when the King is in residence.” That is what joy is — this sense of our unity with Jesus, the sense of his power, his adequacy, his ability to handle the problems which are thrust upon us. Let all that be present in the heart, and the face will light up with joy! A deepening of the experience of love, and joy made full. What a wonderful relationship our Lord taught us here by this lesson of the vine! Our Father, as you have been walking through your vineyard this morning, you have been looking at various vines growing here. On some, Lord, you see sucker shoots which need to be pruned away. We thank you for your faithfulness in being at work to do that. On others you see luscious, tempting, delicious fruit which gladdens and delights your heart, glorifies you, and we thank you for that. We know that your work with us is to the end that we may produce more fruit, that all of us here in this vineyard will be so fruit-laden, that it will be a fruitful place which will make the world around us drool with desire to learn the secret of such fruit. We thank you for these possibilities which we have in Jesus Christ our Lord. We pray in his name, Amen.